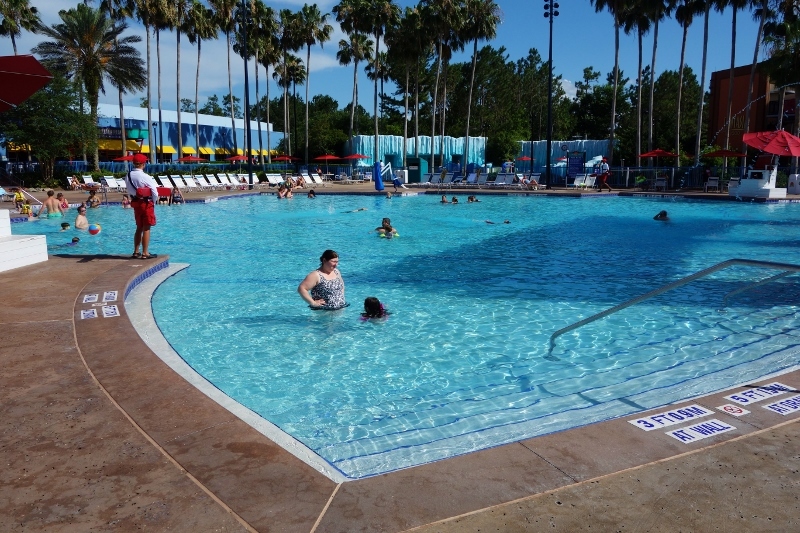 Each of Disney’s All-Star Resorts has two pools. 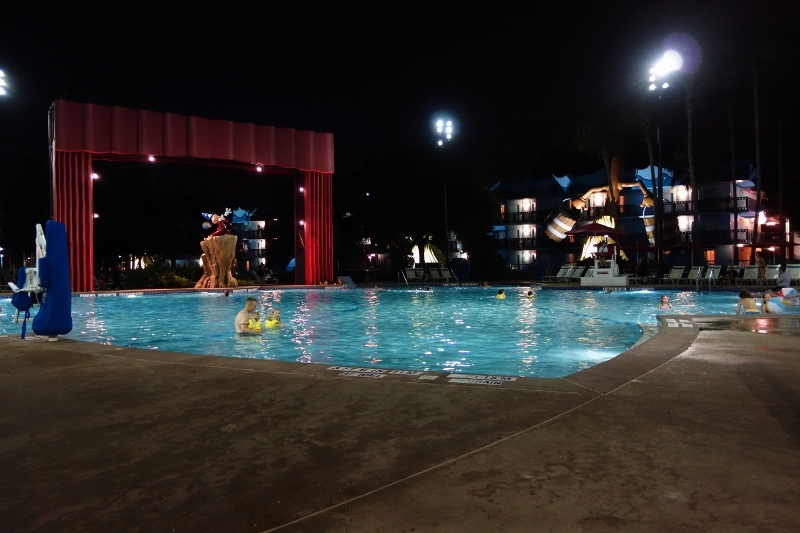 There’s a larger one between two accommodations buildings just outside of the central lobby/dining/shops area, and a smaller one back in a different area. 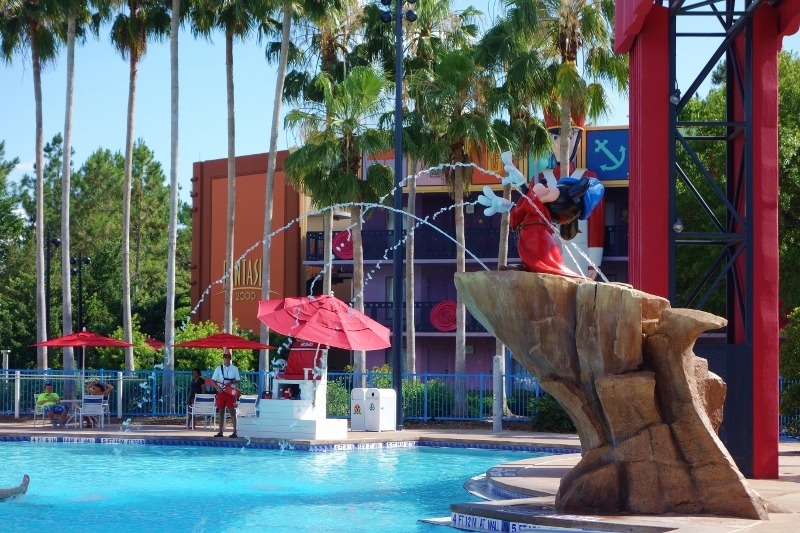 At All-Star Movies, the larger main pool is between the Fantasia buildings and is themed as the area into which Sorcerer Mickey empties water. 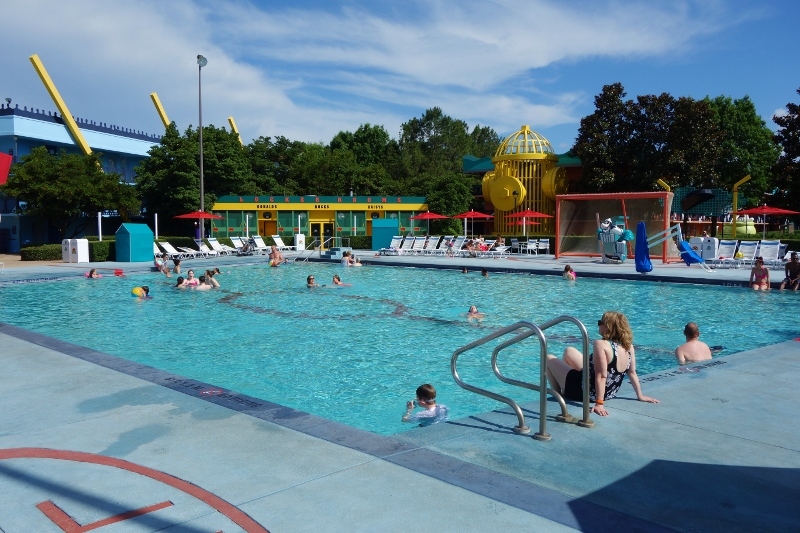 Here you’ll also find pool games played with Disney cast members, and evening movies. The smaller one off to the side in the Mighty Ducks area, is themed as a hockey rink (but warmer!) 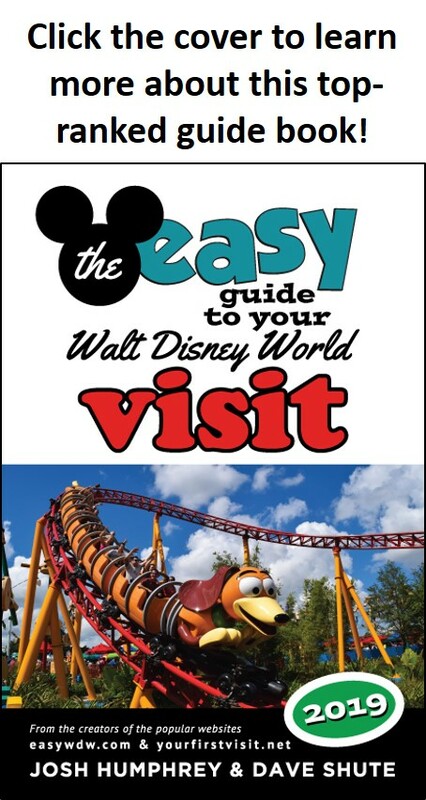 is accompanied by Goofy. 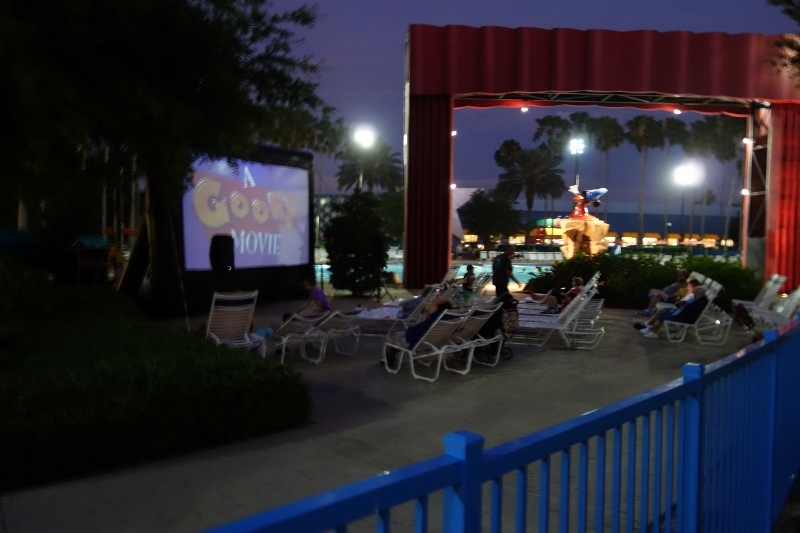 Movies show here at night. 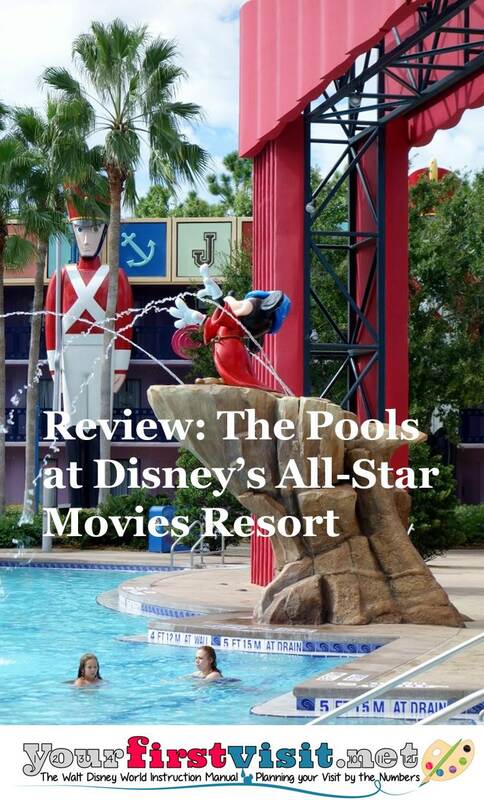 Each of the All-Stars has a different movie schedule, so also checkout what is playing at All-Star Music–an short walk away. 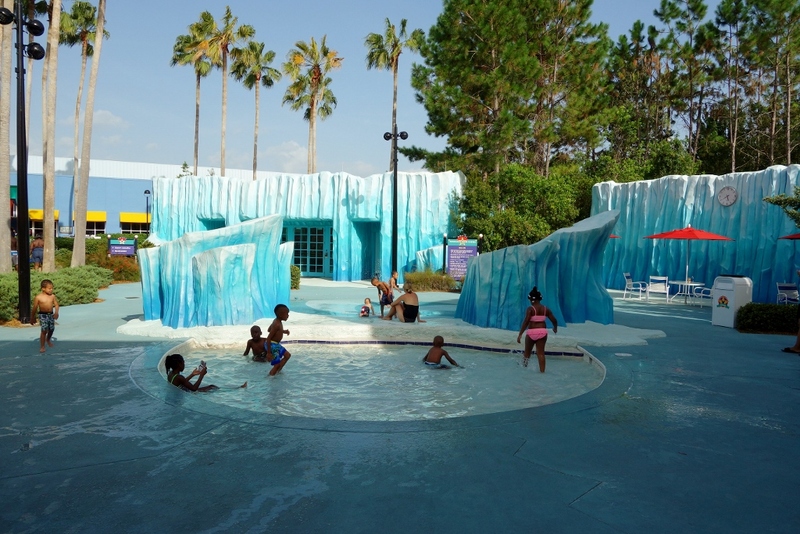 Nearby is an icy-looking kid’s play pool, the best at the All-Stars because it has both a pool area (as the others do) and, uniquely, a water jet area. Note Disney’s restraint in not converting this to a Frozen theme. 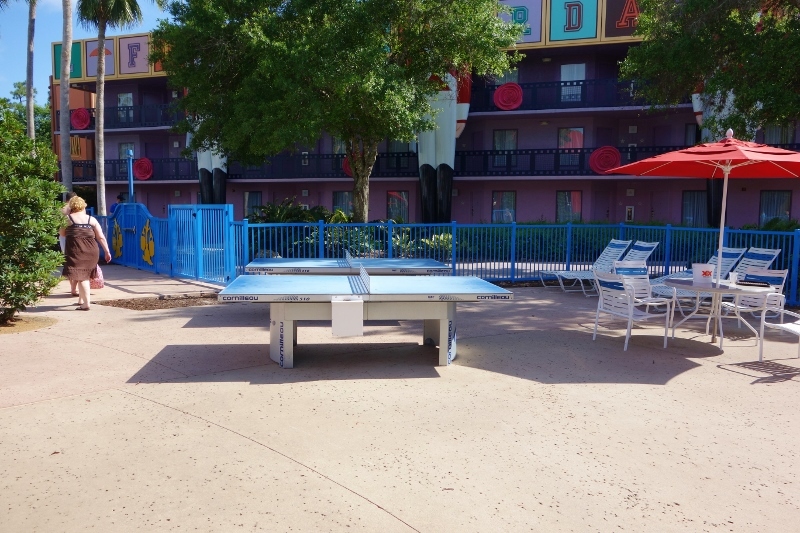 There’s also pool-side ping pong tables. 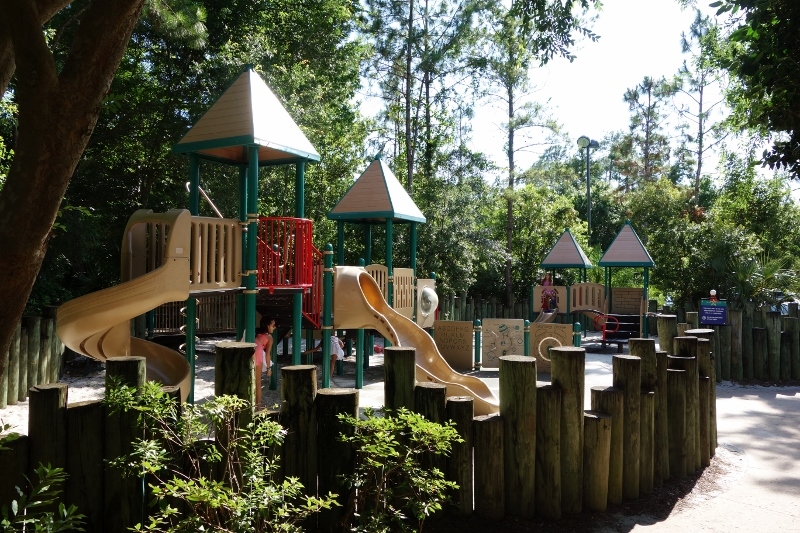 A little away from the pool, between Toy Story and Fantasia areas, is a playground. 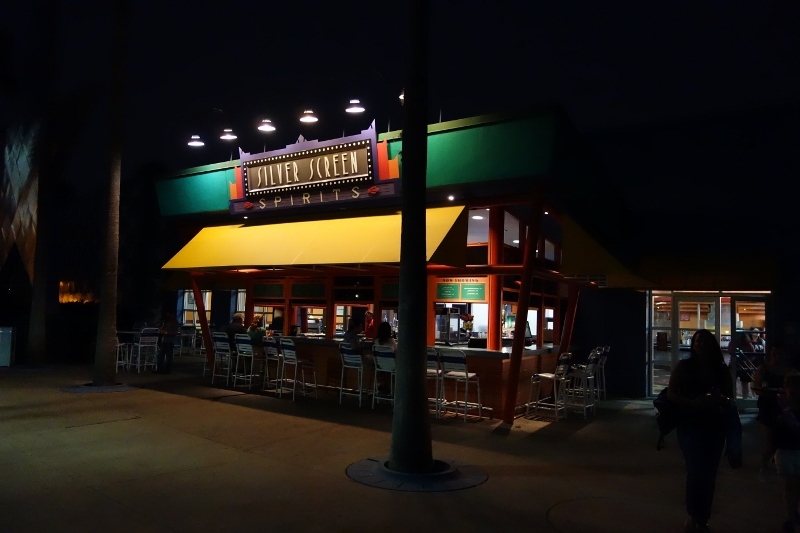 Between the pool area and the food court (and serving both) you’ll find this bar. 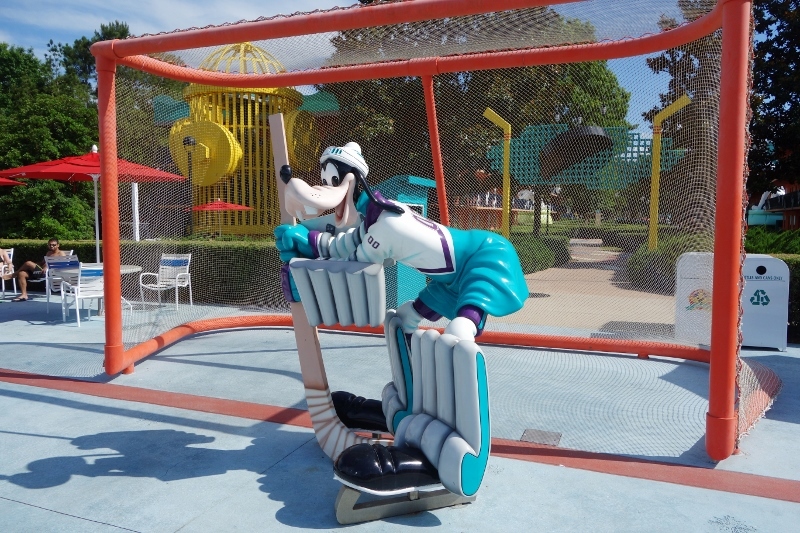 Deeper in the resort in the Mighty Duck area is the Duck Pond pool, themed as a hockey rink with Goofy in as goalie. 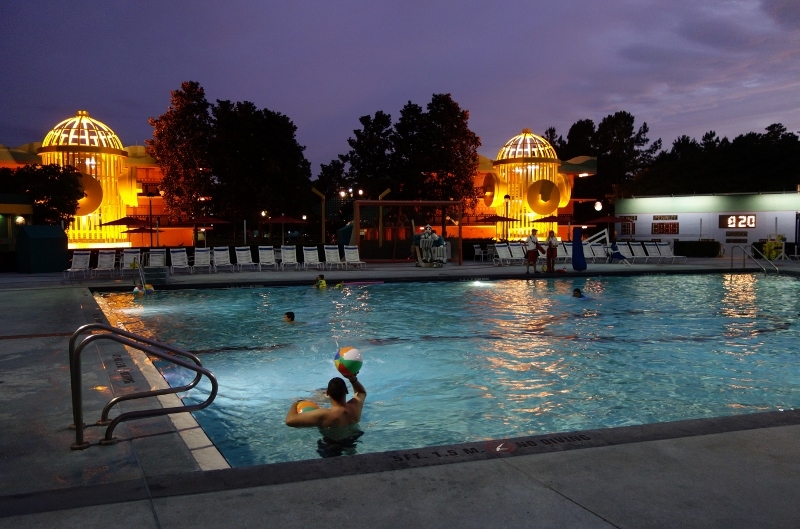 …and the pool at night. 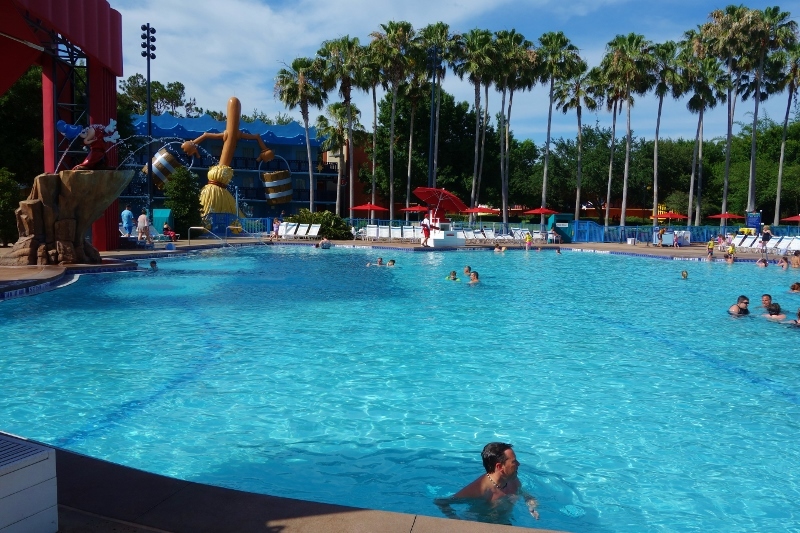 None of the pools at Disney’s value resorts have slides.